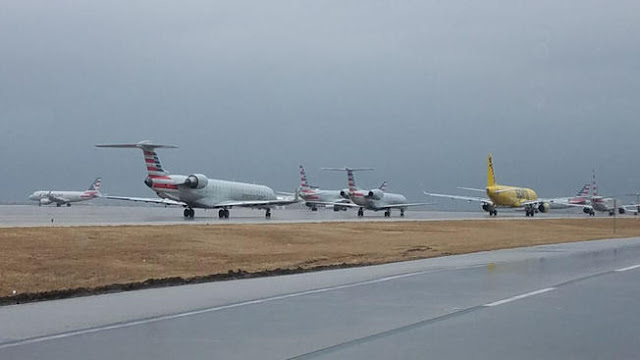 On March 9, 2017 at 1915 central standard time, American Airlines flight 2588, a Boeing MD-83, N9615W, from Toronto, Ontario, Canada to Dallas-Fort Worth International Airport (DFW), encountered turbulence at flight level 280 (FL280) during cruise flight from Toronto, Ontario, Canada to Dallas-Fort Worth International Airport (DFW), Dallas, Texas, resulting in a serious injury to one of the flight attendants (FA). None of the other passengers and crew members were injured and the airplane received minor damage. According to the operator, while enroute to DFW at FL 280, in intermittent IMC conditions at 0.74 Mach, the flight crew was deviating left of assigned course to avoid weather and was northeast of Memphis . The seat belt sign was on and the on-board radar was not depicting any precipitation. The aircraft experienced unexpected turbulence. The #2 and the #4 FAs were seated in their jumpseats in the rear of the aircraft, however, their seatbelts were not fastened. Both the #2 and the #4 FAs struck the overhead ceiling panel and fell to the floor. No passengers reported injuries and the FAs were able to complete their duties. Emergency Medical Service personnel met the FAs at the gate and transported to the hospital. Both FAs were treated and released from the hospital that evening, however, the #2 FA was later diagnosed with fractures to her vertebrae. an inadvertent encounter with convective turbulence.